Kenton's Infotainment Scan: Will you do your part in the Donut Wars? I'm still a die-hard Krispy Kremermyself, Kenton. I've always found both the other chains to make pretty blah donuts. They just never seem fresh (probably because they are pre-made and frozen until the day they're sold). At least KK's are freshly made, as anyone who's watched them being made in the store can attest to. 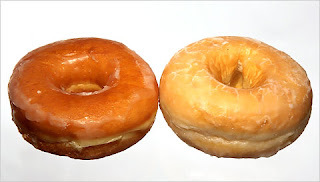 And there's just no comparison in terms of the gloriously high-caloric, gut-busting, "you'll regret it later" but oh so gooey and good donuts served there versus the other two. To me, Tim's is all about the coffee, and the donuts are like an afterthought. Why do these same Canadians leave for work twenty minutes earlier so they can get through that line and still make it to work on time? The coffee. And why are Canadian coffee drinkers now divided into two categories after we were subjected to an American invasion years ago? (and I assure you we did not make that big a stink about it!) Tim drinkers and Starbucks drinkers, that's how we break down now. And Starbucks does not make donuts. Coffee fuels the world, donuts just fuel it police forces.